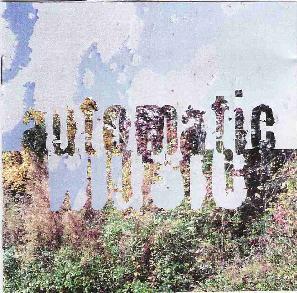 The liner notes to the latest Automatic Music release contain reflections by keyboardist East October on the status of the band and imply that this may be the last we hear from Automatic Music. That would be a shame because this improvisational outfit with its fluid membership has produced some varied and exciting music. But on the bright side, they will have left a fairly large recorded legacy that covers a range of stylistic ground from psychedelic freak rock to experimental free-improv. Disc 1 of this 2-CD set was recorded live in June 2003 and features the quintet of Gentlemaniac on guitar, East October on keyboards, Jeff "Tragic Bunny" Mills on guitar, Bret Hart on multiple instruments and efx and Gurney Brown on drums. This set took me pleasantly by surprise. And if this is truly the last ever live Automatic Music performance it's a hell of swansong, featuring what must be the most purely acid drench psychedelic music I've heard from them to date. The entire set features balls-to-the-walls jamming trip rock, with bubbling guitars and lysergic leads. Hawkwind's classic live Space Ritual came to mind more than once. The recording is raw, but so is the music, which focuses on cranking out drugged, exploratory, 70's styled rock music that stretches out into space and rips it up on 5 tracks ranging from 10-23 minutes of pure psychedelic improvisation. And while the band never leave their psychedelic jam theme, they do keep things interesting with changes of pace, efx embellishments, minor stylistic excursions, and occasional infusions of avant-garde bits that add an extra boost of color and spice. Turn on the lava lamp, fire one up, and you're off!! Disc 2 is very different, being a 15 minute mini-disc of music recorded at Bret Hart's house by the trio of Gentlemaniac on acoustic guitar, East October on keyboards and Bret Hart on multiple instruments and efx. On "Only The Tower Remains", East October's keyboard melodies have a playful feel, and are accompanied by Bluesy, dissonant guitar. I really like the contrast between the keyboard and guitar styles that go together so nicely. But "The Twilight Of Eternity" is the highlight, having a dreamy quality, but also a somewhat intense orchestral thematic development, and a parade of percussives, atmospherics and efx. Very cool. And I don't want to be a tease, but I can't resist mentioning the extra 30 minutes of avant-rock jams and insanity I got on the promo version of this set. Fun stuff!! Now forget I said that and just check these guys out if you haven't already done so. Look to the Aural Innovations alpha index to read numerous reviews I've written of past releases and you'll see that there's just no pigeonholing this band.